Gosport hospital deaths: when did ‘life shortened’ become a euphemism for murder? The revelation that more than 450 patients died in a Gosport hospital after being administered an overdose of powerful painkillers is shocking and appalling. Or, in the words of Theresa May, “deeply troubling”. The independent panel report into the ‘culture’ of administering dangerous and unjustifiable amounts of medication at Gosport War Memorial Hospital found that a further 200 patients may have suffered a similar fate, but their records have gone ‘missing’. So that’s potentially 650 patients who entered the hospital for some sort of rehabilitation, but never left. The report found there was a “disregard for human life” of a large number of patients from 1989 to 2000. 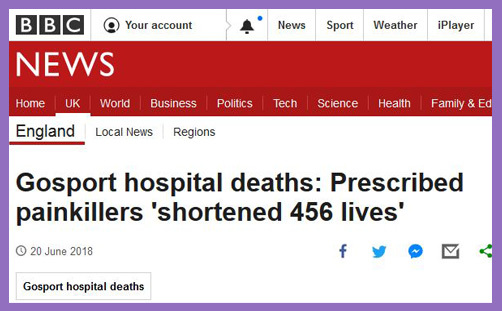 The media reports all talk of “shortened lives” (BBC, Channel 4, Guardian, Independent, Sun, and even the Daily Mail…). Is this because the report uses the phrase? By talking about “a culture of shortening the lives of a large number of patients”, are we not in danger of concealing a manifest evil? What’s the difference between ‘life shortened’ and murder? If a doctor puts down a person like a vet would a dog, in what sense is that not murder? We don’t say, “I’m taking Fido to the vet’s to have his life shortened”, do we? To be put down is to be killed; to be killed unlawfully is to be murdered in some degree. God did not say, ‘Thou shalt not shorten life’; the commandment is ‘Thou shalt not murder’. It isn’t just a practical house rule for good order, but an ethical imperative for individual salvation. A life shortened may be socially and medically reasoned, but murder is forbidden by moral principle, for it is an intentional evil with manifestly evil effect. It therefore needs to be called precisely what it is. And yet this report (and so all the consequent media reporting) of what is (let’s be frank) mass murder by opioids, talks of ‘life shortened’. Is it because of the method? If a doctor had stabbed 650 people to death, or blasted them with an AK-47, would the media still be talking about ‘life shortened’? Is it because it’s more comforting to talk about a gentle morphine-induced drifting off with the fairies, as though these people were considerately and compassionately silenced by an overdose? The culture of ‘disregard’ was apparently complemented by decades of conspiracy and cover-up. Thanks to the quest for truth and transparency led (again) by the Rt Rev’d James Jones, the families of those who had their ‘lives shortened’ are on the path toward some sort of justice. But nothing is to be gained by perpetuating the cover-up by adopting ‘life shortened’ as a euphemism for murder. Some 450 people, and possibly as many as 650, were killed by medical professionals whose vocation is supposed to be to heal and not harm. They did not blamelessly shorten hundreds of lives for valid medically-intuitive reasons, but killed them purposely and unlawfully. By talking of life shortened, the formal truth and moral truth about murder becomes imprecise, if not muddled and confused, as though the human act may be validly authorised because the effect may be arguably proportionate: these were all elderly and ill patients, after all. The thought behind the act which leads to a ‘life shortened’ becomes somehow different from the thought behind the act which leads to murder. It isn’t: the finality is arrived at by the same act. These patients were murdered: those who killed them are murderers, not life-shorteners. But just consider, if this deliberate horror can happen to 650 people now, how many thousands could have their ‘lives shortened’ unlawfully when Assisted Suicide becomes legal? O brave new world that hath such doctors in’t.